How deadly are the world's tallest mountains? 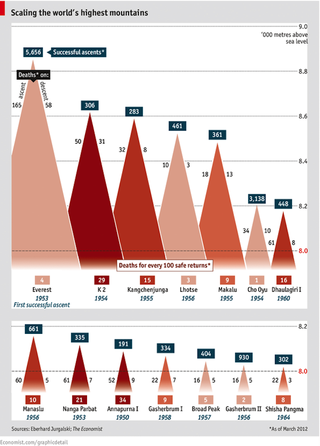 Sure, Everest has claimed the most lives – but its death/successful-ascent ratio is actually pretty low. Everest's smaller and less well-trodden Himalayan sisters tend to be much deadlier. For every three thrill-seekers that make it safely up and down Annapurna I, one dies trying, according to data from Eberhard Jurgalski of 8000ers.com, collected in his forthcoming book "On Top of the World: The New Millennium", co-authored by Richard Sale. This goes some way to explaining why it is the least popular of the 14 mountains over 8,000 metres, having seen just 182 safe returns.